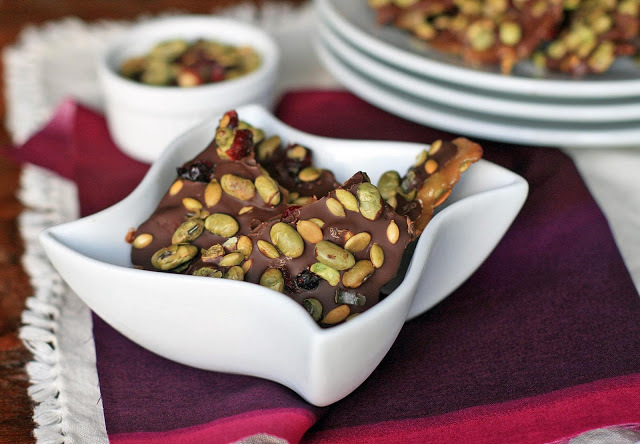 OK, I realize that some of you are probably thinking that edamame toffee doesn’t sound all that appealing. And a couple years, I would have agreed with you. But then I tried Trader Joe’s chocolate covered edamame and I became a believer in the combination of chocolate and soy. And since there aren’t any Trader Joe’s out in the 50th state, I had to take matters into my own hands. 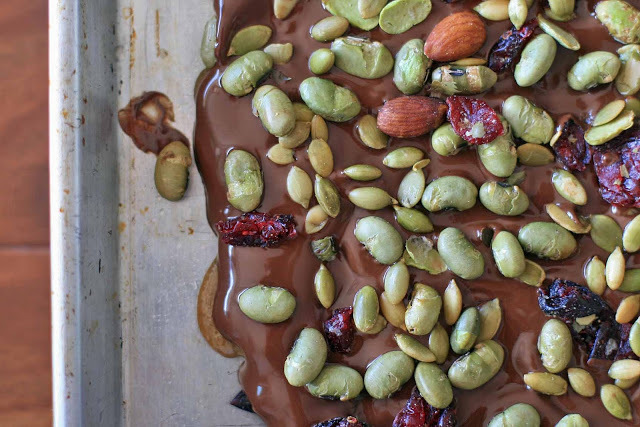 I’d been making a chocolate and almond toffee for quite some time and decided to just replace the chopped almonds with roasted edamame. Call me crazy, but I think edamame works even better since it adds a salty edge. 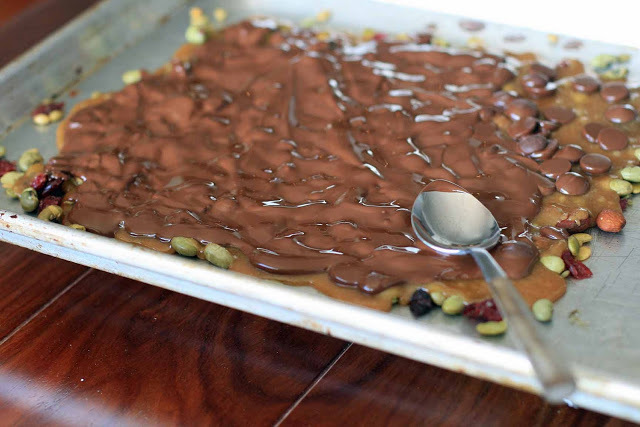 This time I lucked out at the store and they had a mix of edamame with cranberries, almonds and sunflower seeds; the combo makes the toffee look so pretty. 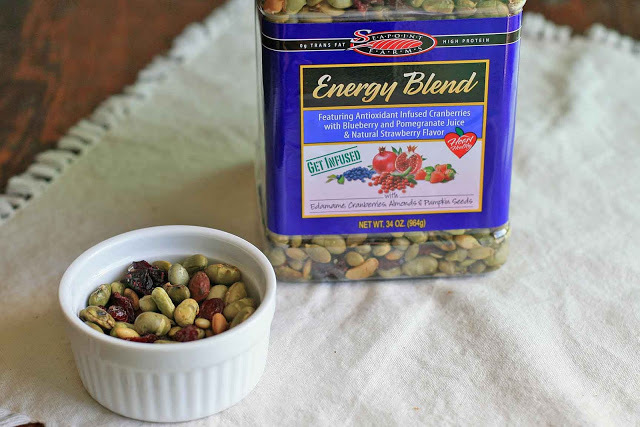 If you can’t find a similar mix, you can always make your own according to your own preferences. Still nervous? Check out David’s tips for candy-making. Lightly oil a baking sheet with an unflavored vegetable oil. Sprinkle half the edamame or edamame mix into a rectangle (about 8-inches by 10-inches) on the baking sheet. In a medium heavy-duty saucepan fitted with a candy thermometer, heat the water, butter, salt, and both sugars. Cook, stirring as little as possible, until the thermometer reads 300 F degrees. Remove from heat and quickly stir in the baking soda and vanilla. Immediately pour the mixture over the edamame on the baking sheet. Try to pour the mixture so it forms a relatively even layer. If necessary, gently but quickly spread with a spatula or the back of a spoon. 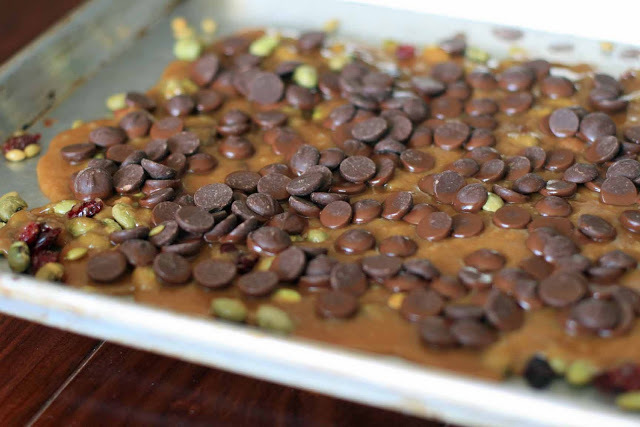 Sprinkle the chocolate chips evenly over the top and let stand 2 minutes, then use a spatula or the back of a spoon to spread in an even layer. Sprinkle the remaining edamame over the chocolate and gently press them in with your hands. Cool completely and break into pieces to serve.